People have been harnessing sunlight to create energy since the dawn of time—and thanks to a new study by scientists at Rutgers University–New Brunswick, we could be a big step closer to maximizing our ability to harvest the sun’s energy. 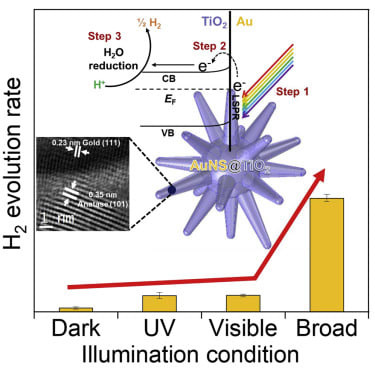 The scientists discovered that star-shaped gold nanoparticles coated with a titanium semiconductor can produce hydrogen from water more efficiently using ultraviolet light and other conventional methods. The engineers focused on photocatalysis: using light as a catalyst to accelerate chemical reactions. The established method of extracting hydrogen from water involves shining ultraviolet light on titanium oxide to achieve photocatalysis. But using ultraviolet light is inefficient. “We leveraged the energy of visible and infrared light to excite electrons in gold nanoparticles,” said Laura Fabris, associate professor in the university’s Department of Materials Science and Engineering, who coled the work. “Excited electrons in the metal can be transferred more efficiently into the semiconductor, which catalyzes the reaction,” explained Fabris. In the study, the scientists coated gold nanoparticles with a titanium dioxide, which acted as a semiconductor. They then exposed the material to ultraviolet, visible and infrared light, and studied how electrons jumped from the gold to the semiconductor in each case. The researchers found that the electrons triggered reactions that produced hydrogen from water over four times more efficiently under visible and infrared light than under ultraviolet light. The gold absorbed the light more quickly and then transferred electrons to the semiconductor, which fired them into the water to break the chemical bond holding the hydrogen and oxygen together—releasing the hydrogen. The star shape was crucial to achieving that efficiency, making it possible for even low-energy wavelengths of infrared and visible light to excite an electron in the tips of the nanoparticle. After activating the particles in the gold, the points efficiently injected that electron into the semiconductor. Hydrogen can be used to store solar energy for use when sunlight isn’t available. Using low-energy infrared and visible light makes it easier to release the hydrogen—which, in turn, could make solar energy storage more efficient. Gold nanoparticles are becoming an increasingly versatile advanced material. In addition to facilitating the extraction of hydrogen from water, they are showing promise as powerful tools for cancer treatment, targeted drug delivery and catalyzing other chemical reactions. Gold nanoparticles are becoming increasingly useful in medicine, energy generation and technological improvements. Read more about the search for renewable energy alternatives at Keeping the Lights On in a Clean Energy Grid is Doable: Study.